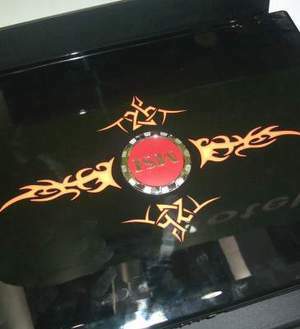 MSI's stand contained some interesting gaming notebooks, featuring not only a funky tribal design and the latest Intel Santa Rosa technology, but also an auto-overclocking button as well. They will be arriving in both 15.4" and 17" flavours and come with a full keyboard including highlighted WASD keys and a numeric keypad. The 17" GX710 comes with either an AMD Turion 64 X2 or Intel Core 2 Duo, HDMI, S-Video and VGA output, 4.1 channel surround sound, and an optional embedded TV tuner. Unfortunately it only comes with an ATI Mobility Radeon HD 2600 with 512MB of Hyper Memory, that makes it as good as useless. For the space a 17" notebook gives you, you'd at least expect a full-fat graphics card with its own memory. 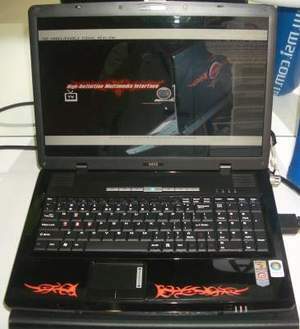 The 15.4" AMD version also comes with the same specifications, but in a reduced size chassis. Though with that said, the Intel version is the one to go for. With PM965/ICH8M and an Nvidia GeForce 8600M GT with 512MB of on-board memory, the GX600 has all the features of the AMD GX610 but also includes eSATA support as well, meaning that this looks to be the far better choice. It also features a turbo button that overclocks the CPU on the fly from 2.0GHz to 2.4GHz by raising the FSB (and subsequently memory speed also) from 200MHz to 240MHz. This function is understandably only available when plugged in, however. You can expect the same turbo button to arrive on the AMD version in due course, too. The design might not be to everyone's tastes, and to be honest, I'm not entirely convinced about the cheap looking plastic either. When will companies learn that perhaps gamers want something impressive, not just extremely outspoken? Let us know your thoughts in the forums.